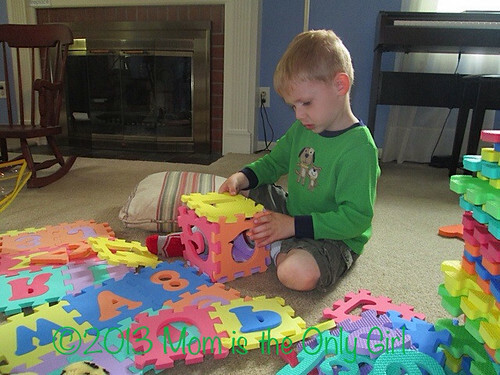 The kiddos love to play with their foam alphabet letters. Sometimes they just lay them all out on the floor and poke the letters out and simply match the letters. Lately, however, they’ve been building with them again. This led to a fun (sneaky learning) game! Next roll the cube like dice. Whoever rolled the die has to find the letter that lands face-up! Of course, there is no real winner or loser, but we like games like that sometimes! This is a great game to accompany learning the alphabet, reinforcing the alphabet and one to one correspondence. It’s also a great gross motor game, especially when you play it outside and the kiddos try to see who can roll the die the farthest! This post contains an affiliate link in which I may or may not be compensated. I link to this source because my children and I love this product.